Most of the work identified for rectification following the initial steam test has now been completed. Machining the safety valves has yet to be finished, and the nipping of a small leak in the steam pipe has yet to be tested before the bottom of the smokebox is concreted. Weighing was successfully carried out on 1 May. The ash pan screens and basket have to be installed, along with one final union for the pipework in the cab. Piglet is planning to carry out another steam test in the latter part of next week, and the formal boiler inspector steam test has been arranged for 14 May. Subject to that being successful, running in can start, and, assuming no problems emerge, the J27 seems likely to be in service before the end of the month. Playtime opportunities are dependent on the boiler inspector. If he is content that the J27 can be run up and down the MPD yard before 14 May, then it may be possible to do something towards the end of next week. If not, then it will be the week after, once the formal steam test has been successfully carried out. I will let know those who have indicated their wish to be involved as soon as I have anything definite. If anyone else wants to take up the opportunity, then please let me know as soon as possible. In the meantime, the immediate focus is on finishing the painting of the locomotive. The back of the running shed was not suitable for that to be done, and while John Furness was able to prep the paintwork there, he wanted it moved to Deviation Shed once yesterday's rain had stopped, so he could work there uninterrupted. The rain duly stopped at lunchtime, and the traumas that occurred in making that move are recorded in my note on the Q6 activities yesterday (which I should correct in that it was the left hand side valve that was put in, not the right - the Q6 is smokebox first to Grosmont at the moment!) which I circulated this morning. 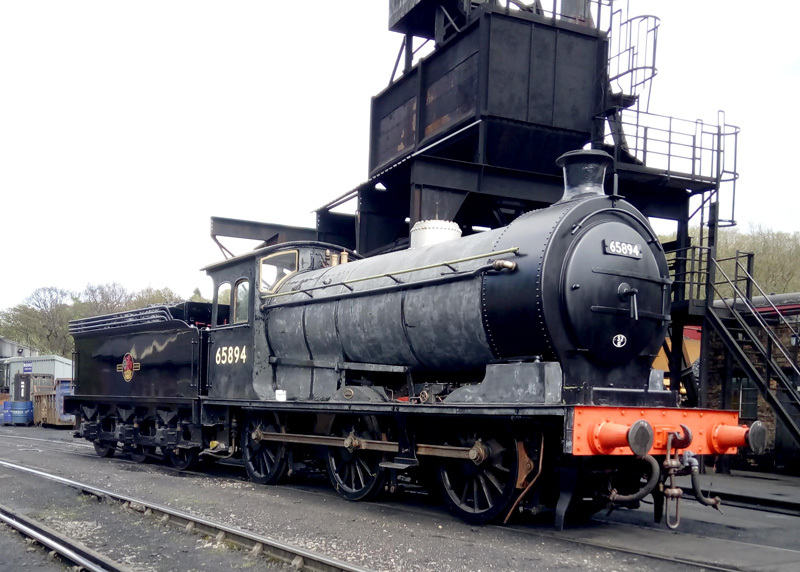 While the J27 was stood outside the coaling plant waiting for the rest of the move to take place however, Roy Marshall took the attached photo for the record. It is now safely in Deviation Shed, and John Furness was going to give it a coat of black gloss today. He would then be back on Tuesday to varnish it, and once that has had an opportunity to harden, the second test steaming will take place. In the interim, Devaition Shed will be open on Saturday, both for a Q6 working party, and also for the public 'Behind the Scenes Weekend'. It is important therefore that anyone there resists the temptation to touch the J27 paintwork or climb in the cab, either of which could damage the paintwork - hugely admire from afar please! Visitors will also be disappointed to see that the Shed inside swimming pool has disappeared. Following the replacement of the missing guttering on Deviation Shed, the pit is now completely dry, in spite of the recent rain, and once we get a chance, the pit concrete floor can be swept and cleaned. The pump is also having a welcome break from action.